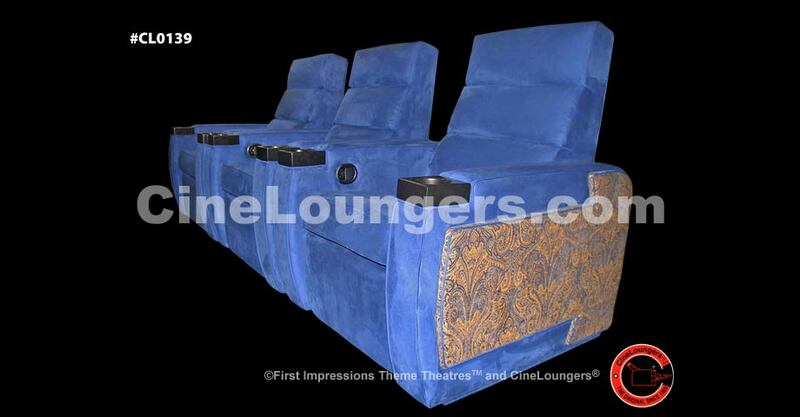 Handbuilt Full Motion Seating for Private Cinemas, Home Theaters and Specialty Entertainment Venues - First Impressions Theme Theatres Inc.
CineLoungers� are and will continue to be truly an engineering phenomenon and remain the preeminent custom theater seating collection with thousands sold and in use every day in private cinemas, motion picture screening rooms, commercial skyboxes and a multitude of special entertainment and hospitality venues around the world. 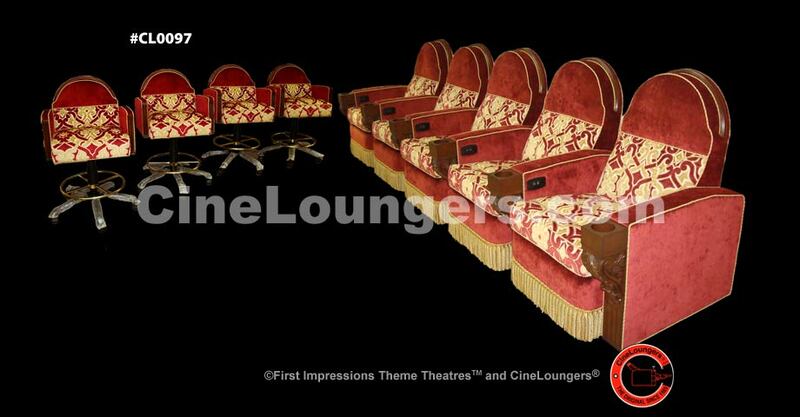 First Impressions Theme Theatres invites you to view the handmade fabrication of our theatre seating in our Miami factory. 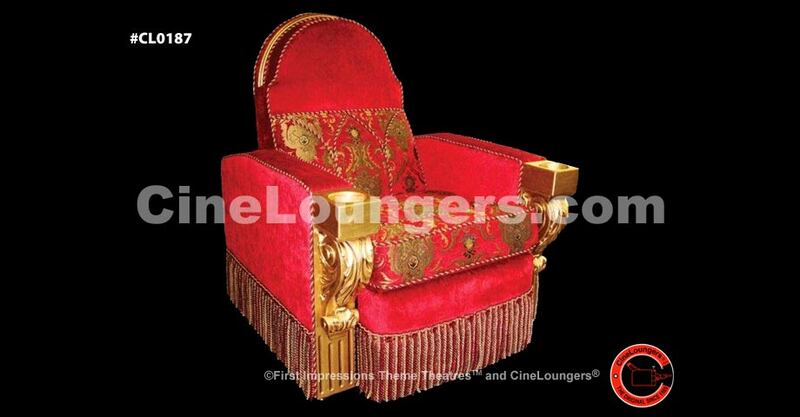 We will alter and custom design any part of our theatre chairs to meet special requirements. 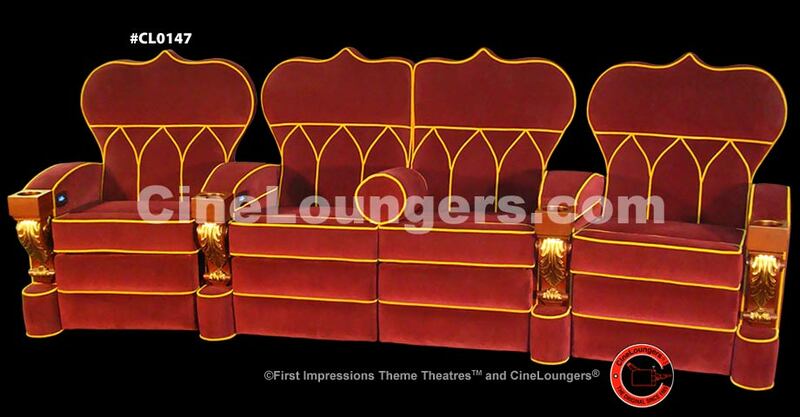 Our competitors cannot possibly offer this personalized service, and our expertise comes with maintaining our own in-house custom furniture manufacturing and hand built upholstered seating operation since 1975. 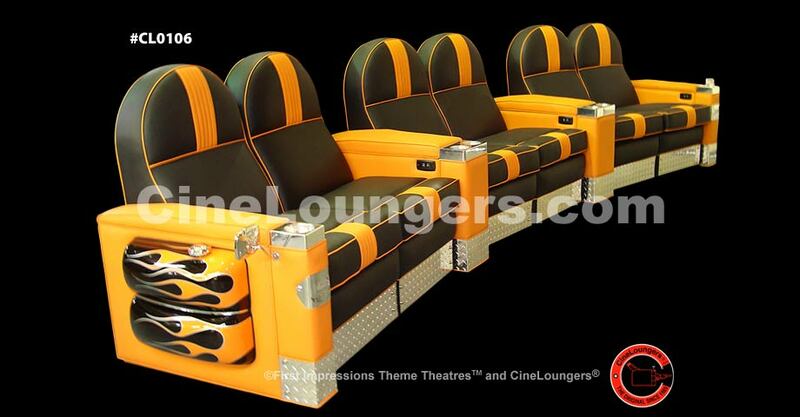 Our sales and design staff are ready to answer your specific theatre seating questions and to produce complimentary AutoCAD theatre seating layouts for your cinema showing proper sightlines, audio monitoring angles, and recommended riser heights for multi-row seating applications. 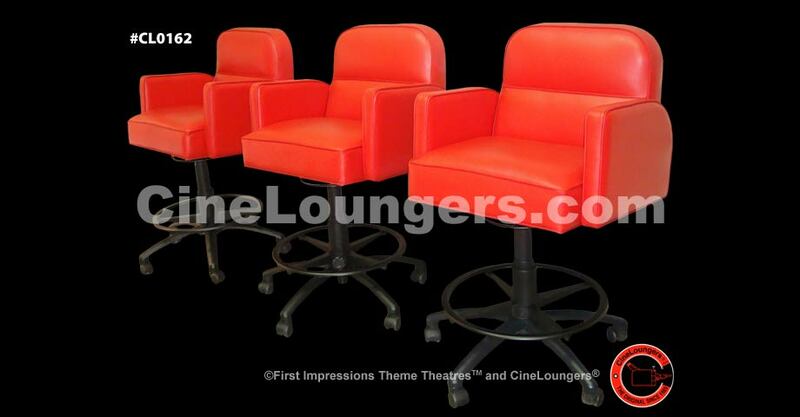 Our most often asked question is, �What makes your chairs different from other theatre seating?” Our theatre seats are totally custom-built, engineered and impeccably tailored in our own state-of-the-art manufacturing facility for each theatre application. Unlimited personalized and ergonomic options include: upholstery size, �seat-ability�, functionality and tailoring modifications. 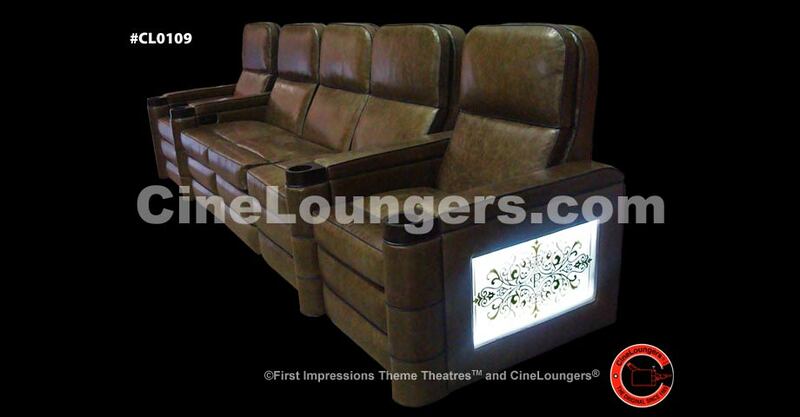 Our patented designs and construction process unquestionably makes our CineLoungers� the most versatile and comfortable luxury theatre seating available, and absolutely the very best home theatre seats on the market, with development history starting in 1985. 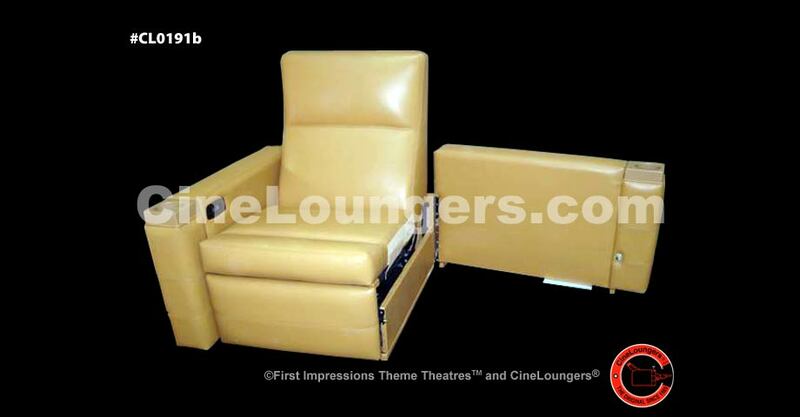 CineLoungers® are handmade, built to order, private theatre, multi-position recliners, space-saving incliners, radical-tilt rockers and radical-tilt rocker-recliners. 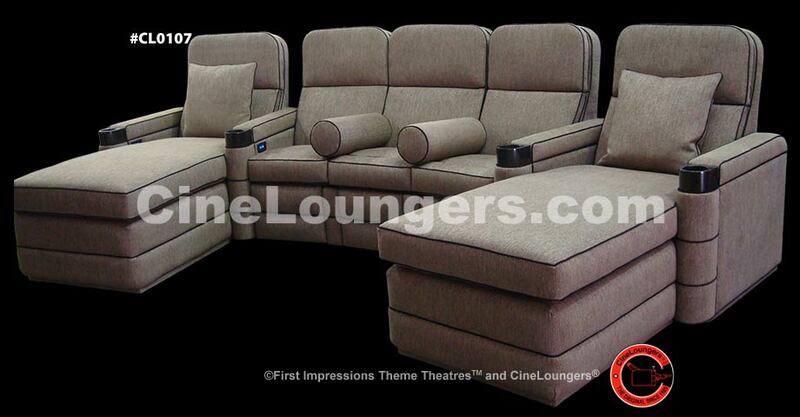 CineLoungers® are individual chairs with two arms, joined with common arms, CineLoveSeats™, CineSofas™,CineChaises™, CineSleepSofas™ or any combination thereof. 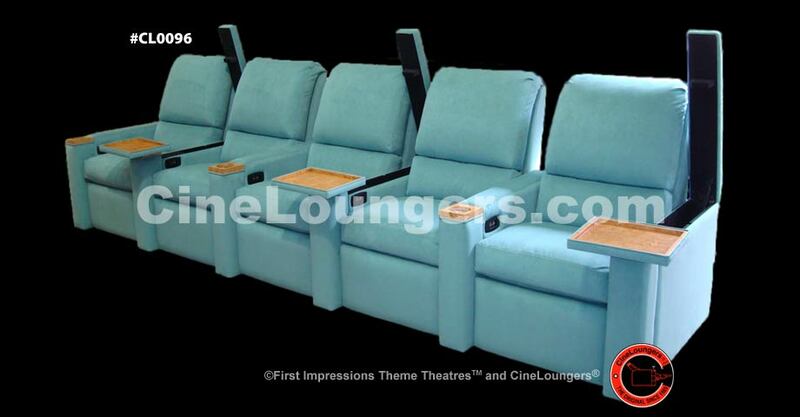 Five standard seat back and arm styles to choose from (round,square, soft square, modified round and camel back). 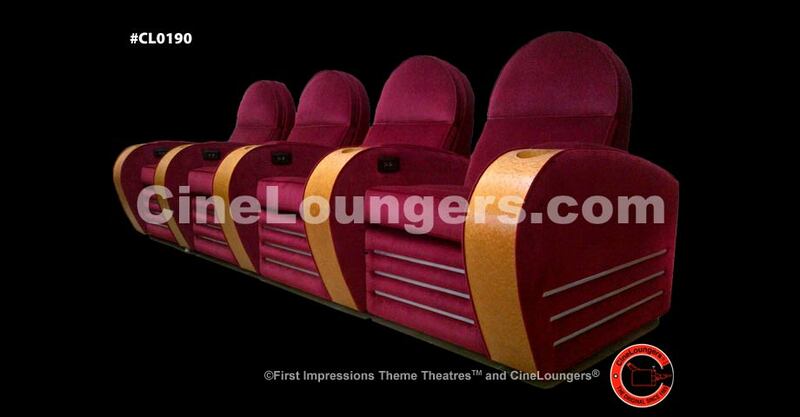 Seven standard seat widths (19-25"); 26" to 28" available for an additional fee. 10 seat widths total. Ergonomically designed lumbar back supports with 100°-125°adjustable and fixed tilt-back neck rests or hidden pop-up headrests (CineLounger® Original only offered with a pop-up headrest). 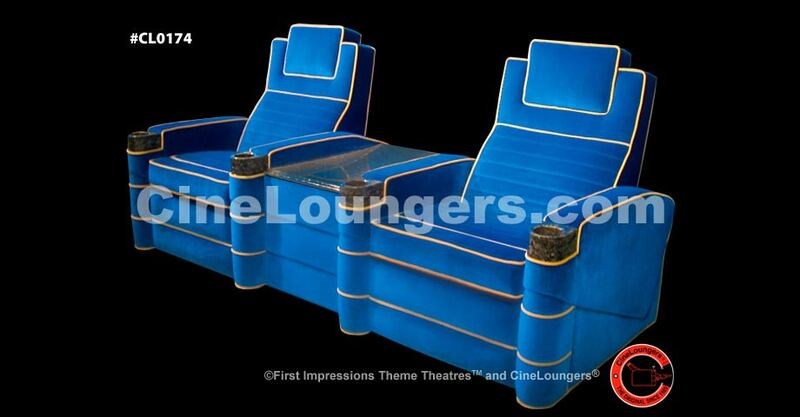 Five-inch thick multi-layered proprietary composition high-resiliency fire-rated foam filled back and reversible seat cushions(CineProLounger™ LTD features attached or “tight seat” cushions). 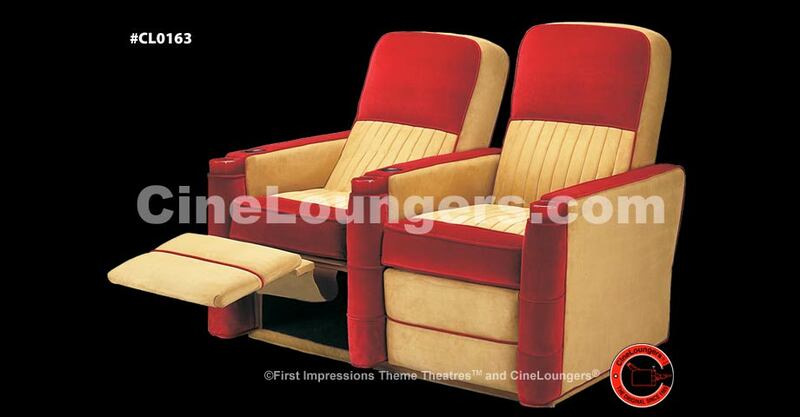 166 high nap, non-rated and fire-rated “Movie-House” Velvet™I & II and III “Movie House” Chenille™ choices, stain resistant, 1-2 color applications per chair. 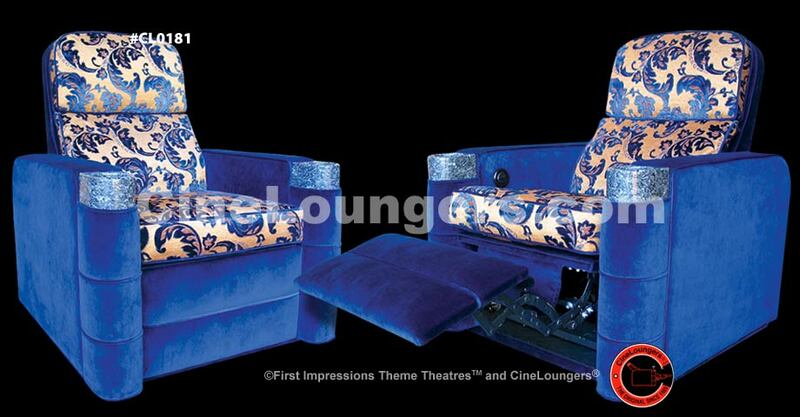 Contrasting ¼-inch thick “Movie-House” Velvet™ I & II and “Movie-House” Chenille™ cording (piping) on arms, back, cushions and footrest. Hardwood frame components, CNC fabricated, mortised tenion joinery, screwed and glued, steel plate bracing at critical junctions. 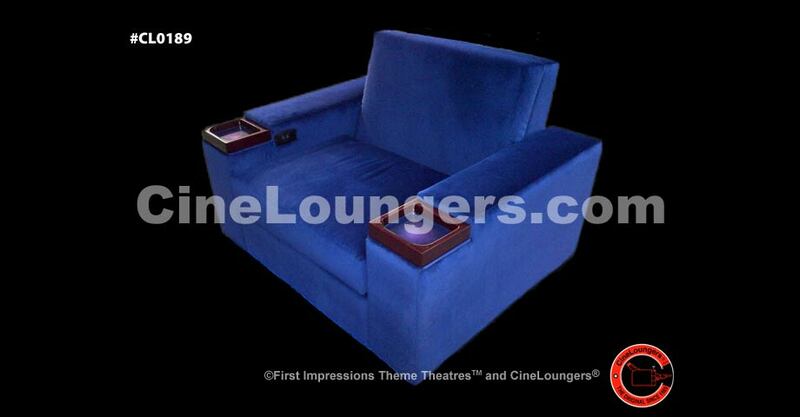 MDF lacquer painted, hand buffed, color-keyed, molded, 2" deep drink holders (round or square) with leather coaster inserts. 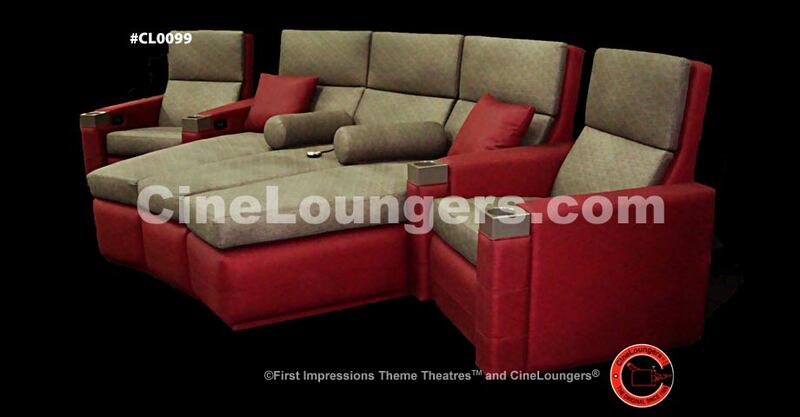 Recessed, upholstered plinth bases with steel fasteners, corner block braces, and de-coupler foot pads. 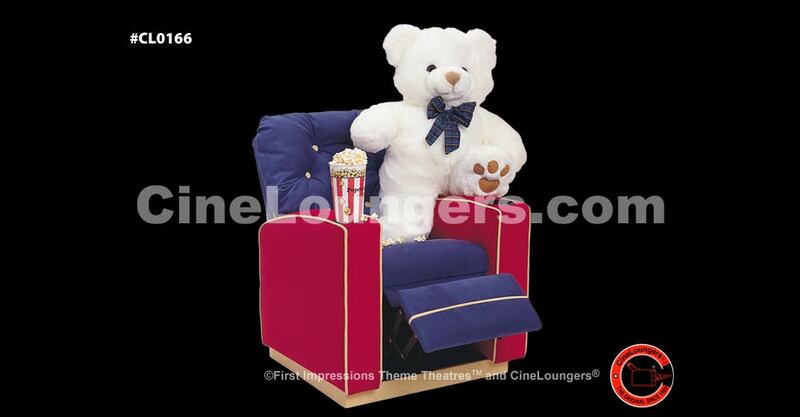 Fire-rated foam used throughout, orthopedic foam used on armrest caps, footrest, headrest and lumbar regions. 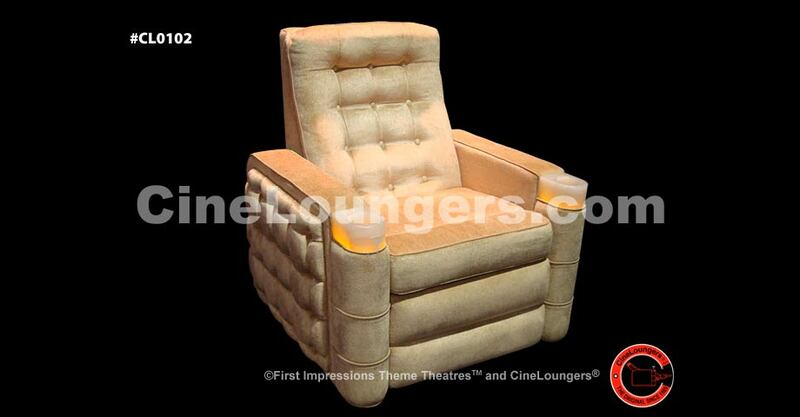 Limited Lifetime Warranty on steel constructed recliner, incliner, rocker and radical-rocker mechanisms. NEW! 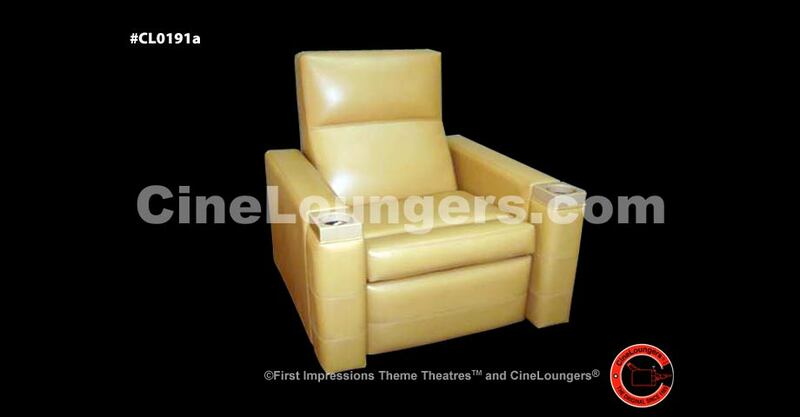 ¼" extruded aluminum “Z” bar fasteners for ease of installation when joining chairs together. Engineered convex neck and headrest supports to capture perfect surround sound effects (all designs curve headrest support away from the listener/viewer’s ears, not pillowing ones head into the chair back). 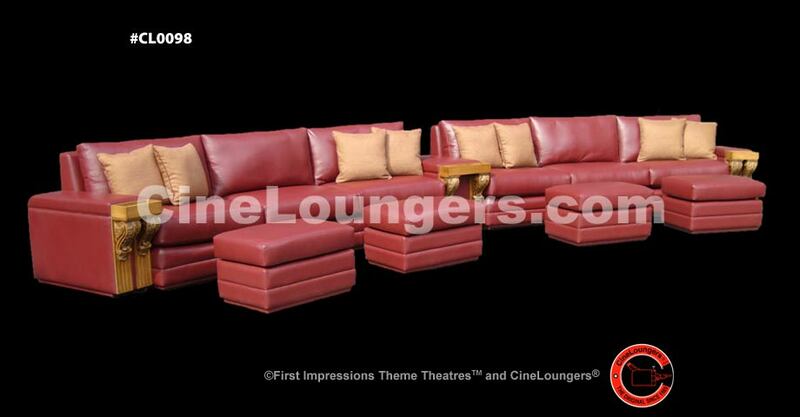 Slipcover tailored bodies and arms for ease of future re-upholstery needs. Computer generated sight line studies for multi-row configurations, plus riser detail construction information with each order. 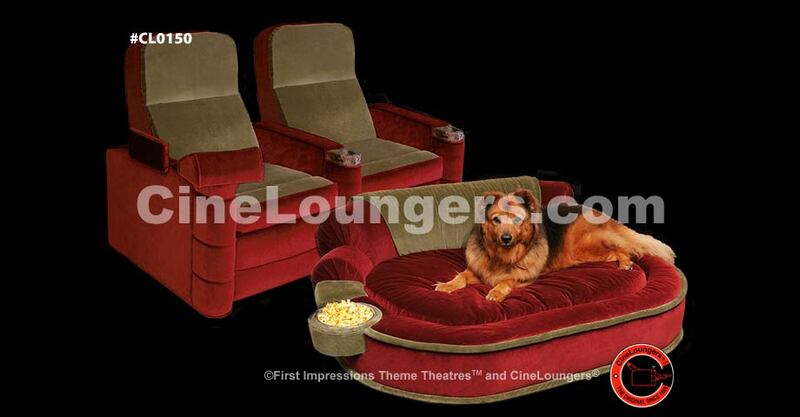 Medium and firm sample seat cushion inserts available with each order for final “family” approval during installation. Polybagged, bubble packed and shipped in custom three-ply cardboard containers with heavy duty strapping and concealed freight damage-shock stickers.